Coloured aquatint of a of Charak Puja on the banks of the Ganges drawn and etched by James Moffat (1775-1815) one of a set of 'Views of Bengal and along the Ganges' published in Calcutta c.1806. James Moffat, a Scotsman, was based in Calcutta from the age of fourteen and is thought to have learnt his trade as an engraver in the city. Charak Puja is a traditional celebration held every April, on the eve of the Bengali New Year. 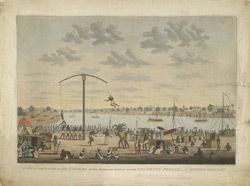 It was known to the British as the 'hook-swinging festival' because many devotees put themselves through painful penances, piercing their bodies with hooks.